Monoclonal proteins are present in the majority of PCL patients. In some cases, a monoclonal protein may be undetectable by serum protein electrophoresis, but clearly indicated by sFLC analysis . A combination of serum protein electrophoresis and sFLC analysis has been shown to be an effective screen for MM, including plasma cell leukaemia  and sFLC analysis should form part of the initial diagnostic work-up of these patients  (Chapter 23). As there are no specific response criteria for assessing response to treatment in PCL, the International Myeloma Working Group recommend the application of the MM response criteria . These criteria incorporate sFLC analysis in the definitions of stringent complete response for all patients, and very good partial response and partial response for patients whose monoclonal protein is not measurable by serum or urine electrophoresis (Chapter 25.3.5). A number of case reports highlight the utility of sFLC analysis for the diagnosis and monitoring of PCL . An example of primary PCL is described in the clinical case history below and a case of MM progressing to secondary PCL is presented in the clinical case history in Section 19.3. Successful treatment of primary plasma cell leukaemia expressing monoclonal light chains . A 40-year-old female presented with conjunctival haemorrhage. She also reported giddiness, fatigue, and weight loss. On examination she was afebrile, and had no organomegaly. Peripheral blood counts revealed she was anaemic (haemoglobin 10.6 g/dL) with a markedly raised total leukocyte count (39.6 x 109/L) and severe thrombocytopaenia (platelet count 1.0 x 109/L). 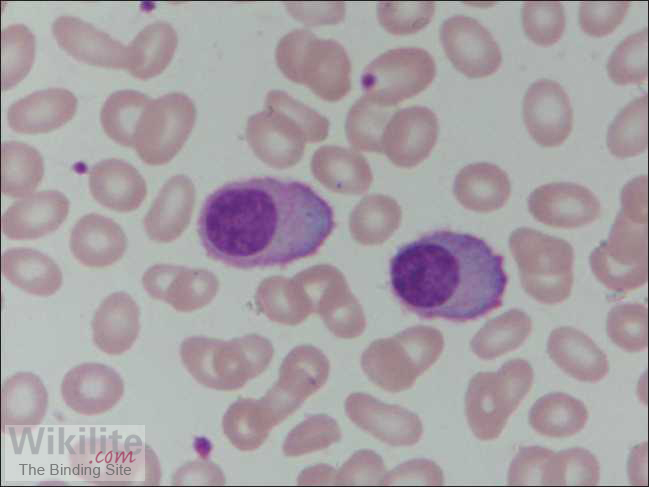 A peripheral blood smear showed a prominence of plasma cells with occasional binucleate cells. A bone marrow aspirate and biopsy revealed an almost complete replacement of normal marrow elements by sheets of plasma cells. By flow cytometry, these cells were CD38+, CD138+, CD117+ and expressed cytoplasmic λ light chain. Serum total protein was low (46.0 g/L) and albumin, calcium and creatinine concentrations were normal. Serum β2-microglobulin was elevated (12.95 mg/L). No monoclonal protein was detectable by serum protein electrophoresis and total immunoglobulins were all low (IgG 3.3 g/L; IgA 0.09 g/L and IgM 0.08 g/L). sFLC analysis showed markedly elevated λ sFLCs (3527 mg/L) with suppressed κ sFLCs (1.15 mg/L), resulting in a highly abnormal κ/λ sFLC ratio (0.00033). Interphase fluorescence in situ hybridization analysis revealed IgH gene translocations and 13q deletions. Radiographs of the skull, dorsal spine, lumbar spine and femora did not reveal any lytic lesions. After a diagnosis of primary PCL was made, treatment with RVd (lenalidomide, bortezomib and dexamethasone) was commenced. Following four cycles of therapy, the patient achieved a complete response with normalisation of κ sFLCs (8.1 mg/L), λ sFLCs (5.5 mg/L) and the κ/λ sFLC ratio (1.47). She subsequently underwent high-dose chemotherapy with melphalan and autologous stem cell transplantation, and was reported to be in complete remission 9 months after her initial diagnosis. Can sFLC analysis help in the diagnosis of PCL? Yes, in some patients sFLC analysis can be abnormal when SPE is negative, and sFLC analysis should form part of the initial diagnostic work-up for PCL (Section 22.2).